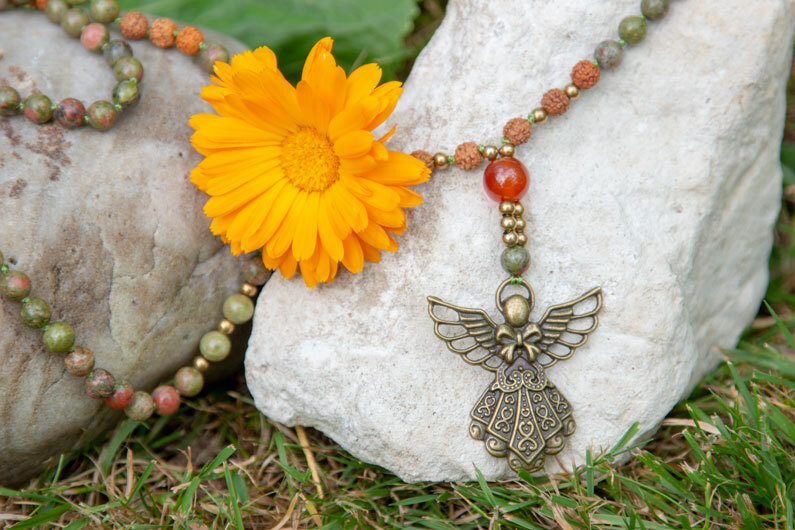 My intention with Joti Malas is to create jewelry that – besides adding beauty to your everyday life – will be a tool to remind you of your Spiritual Self every single day. Crystals and gemstones are magical and beautiful, and gemstone beads are the main element of all my jewelry and malas. Everything is handmade with loving attention and every piece of jewelry is encoded with spiritual intention. My creative process is always filled with mantra magic – and every piece of jewelry is charged with unique mantra energy that matches the stones, day, season, and Mother Earth cycle. When you wear jewelry with crystals and gemstones, you surround yourself with the healing energy of Mother Earth. The stones lift your energy and support your personal process. A mala is a traditional meditation beaded chain. It consists of 108 beads + a guru bead and a tassel, a pendant or another beautiful ending. The tassel symbolizes the earth. You can use your mala as a necklace or bracelet and you can use it during yoga and meditation as the focal point and energy support. You can choose from the gemstones that are used in the piece. 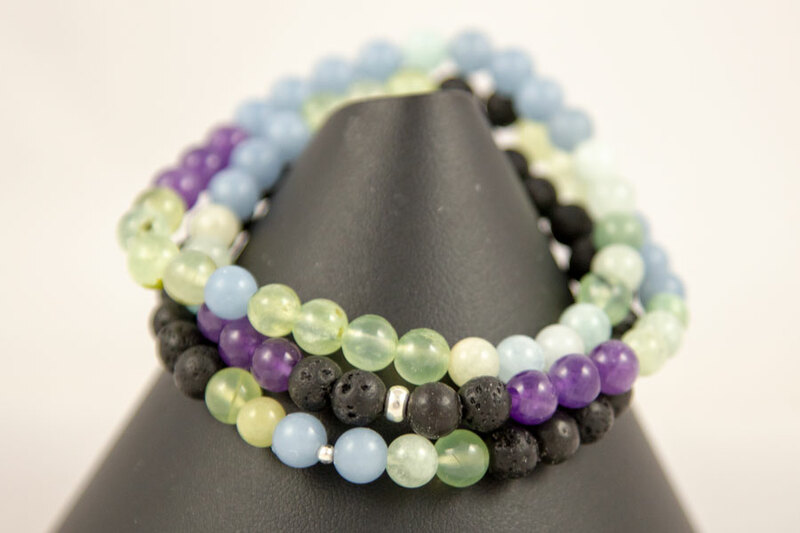 Check out the description of the bracelets and mala necklace you feel attracted to and choose a piece of jewelry that supports the intention and goal you have in your process. You can simply choose with the heart by noticing if a piece of jewelry is calling for you. Maybe you can’t help but look at this particular piece, or you think about it after you’ve stopped looking at the shop. You may feel it physically, in your body, or keep seeing the piece in your mind, or you may even hear it whisper to you. Do you have special wishes? I would love to make a unique piece of jewelry, especially for you. Please contact me here and tell me about your intentions and dreams, and I will help you find the right stones and symbols for you. I´ll create your very own personal mala or bracelets JUST FOR YOU. When you receive your jewelry, it is already cleansed energetically and encoded with the overall intention that the gemstones support. Find a quiet place where you´ll be undisturbed for a few minutes. If you have an altar in your home it will be a good place. You can also bring the jewelry out into nature if this is where find your inner peace and centering. Sit down or stand quietly with your piece in your hands as you hold in front of your heart. Visualize or feel the intention you have with your jewelry. What do you want help with? How do you see your life being when you have reached your goal when your intention is manifested? Stay here for a few minutes with the jewelry while you see / feel clear, golden or white light flowing down and into the stones of your jewelry. The gemstones in your spiritual jewelry will feel your intention and absorb the energy. Your piece is now ready for you to use it as your very personal healing jewelry. I recommend that you wear your new jewelry daily for 1-2 weeks, so it has time to connect with your energy and start the healing on a deep level.